This novel for younger readers seemingly begins as a collection of funny anecdotes about a beloved family pet. It then begins to grow and weave in to a touching story about family and love – all told from Corey’s point of view. My Book Corner highly recommends Just a Dog for those who are moving on to more detailed, slightly more complex chapter books. … and reminiscing about his antics at the end brings the family together with the hope, the hint, of greater things to come. The tales are expertly told, in a sensitive yet humorous style adeptly capturing Corey’s feelings and point of view. From a practical point of view the shorter chapters result in a manageable text, yet each has enough depth to ensure this is good quality literature for children. The way in which Michael Gerard Bauer begins to sneak in little snippets, hints which begin to link it all together is inspired … and is a great one for younger readers to begin really developing their predictive abilities. My Book Corner believes this one could be sneaked in to a literacy lesson quite nicely! 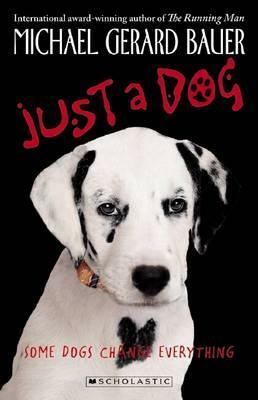 Just a Dog also reviewed by Dudley the canine columnist HERE!